Legal news for Pennsylvania SUV rollover attorneys— A rollover claimed the life of one young woman. Pittsburgh, PA (NewYorkInjuryNews.com) – Two weather-related motor vehicle accidents occurred Wednesday night in the Pittsburgh area, January 6, 2010, according to WPXI. The first crash took place at 11 p.m. in Monroeville on Thompson Run Road. The victim of the wreck was identified as 22-year-old Jennifer Cwynar, of Turtle Creek. Her parents had warned her of the icy conditions that night when they had spoken to her. 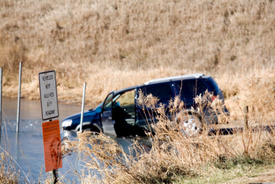 Jennifer lost control of her SUV and rolled into a nearby embankment, where officials found the wrecked vehicle in the creek. Officials reported that she was wearing a seatbelt. Another fatal accident occurred shortly before 6 a.m. Thursday morning in East Franklin Township on Tarstown Road. Police officials reported that a semi truck and another vehicle collided, which claimed the life of one person and injured two more. The unidentified victims were transported to area hospitals via responding ambulances. Officials reported that the Parkway East and all exits feeding into the highway from the Turnpike were temporarily closed off from all motorists due to the unsafe icy road conditions. There were other motor vehicle crashes reported, although there were no injuries called in to the police. C.T. firefighter electrocuted in cottage blaze!